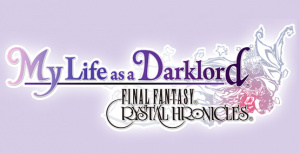 Here's your chance to try out life as a Darklord! Introducing a new hero - or should that be villainess? The daughter of the Darklord! Set fiendish traps for any adventurer foolish enough to cross you, then send in your monstrous minions to finish the job! 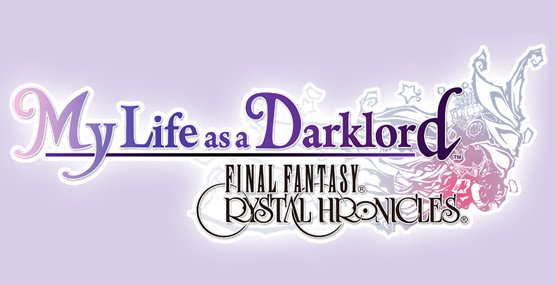 FINAL FANTASY® CRYSTAL CHRONICLES®: My Life as a Darklord™ puts you in the highly fashionable shoes of the Darklord's daughter, a malevolent little Miss, charged with dispatching intruding do-gooders by strategically placing traps and monsters around the tower she calls home. You'll need to get your hands on ever more diabolical traps and abominable monsters if you're going to stop those pesky adventurers from making it to the Dark Crystal at the top of your tower. 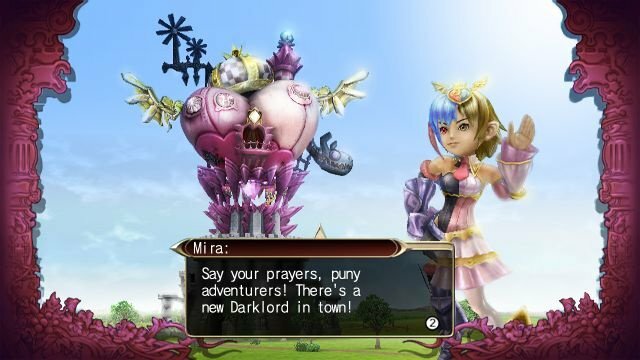 Be warned, though - with heroes of all the races and job classes from the FINAL FANTASY CRYSTAL CHRONICLES series storming your lair in real time, your traps and minions will count for nothing unless you deploy them like a true evil genius. Anything less, and your beloved home will be reduced to rubble before you know it! For more information, please visit the official website at http://www.MyLifeasaDarklord.com. Sounds interesting. Maybe I'll finally get the first My Life As a King now that I can put it on my SD card! Its like they gone and done a City of Heroes thing; except this would be more City of Villains. Almost a must-buy IMO. Can't wait to get this. @Stuffgamer1: Get it. It's really good. A cross between My Life as a King and Dungeon Keeper (hopefully)? Count me in. I'm interested in this but I hope the gameplay has some major additions because otherwise I'll be bored, having already put 20 hrs into the first one. Sounds almost like tecmos Deception for playstation. Sounds neat. I'll probably get it unless it's too much like MLAAK. EDIT: It's hardly like MLAAK, so I'll get it. I'm glad Nintendo added the option to run games from an SD card. Sounds cool, kind of a RTS/Tower Defense -ish thingy? 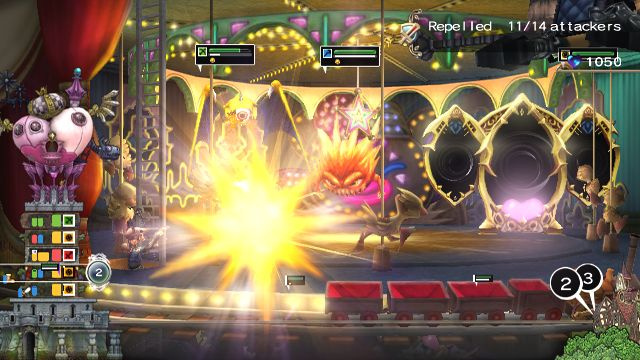 This is possibly one of the few up coming Wii Ware games I might get excited about!!! I might not get it if its 1500 wii points.. It might have the content, but I'd rather get other things if its that expensive. I just played the first chapter and I have to say that I am impressed! I just want to share a few facts with you. SPOILER ALERT! 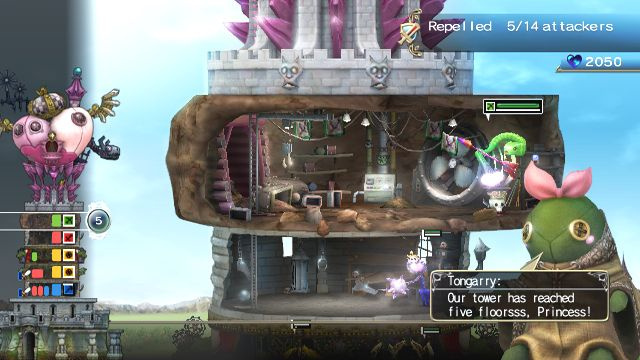 you add floors to your tower and set traps and foes for the arriving "do-gooders"
I only played about an hour so far but I'm really having a great time and can't stop playing. 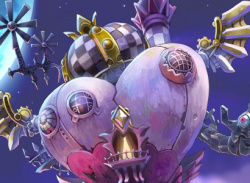 I do recommend the game for tower defense game fans & FFCC fans, too. If your still unsure wait for nintendolife's review. I have to defeat some more "do-gooders"! I forgot to mention that I love the Tonberries!!! Is it like Crystal Defenders? Im geting this on moday. (BUY IT KNOW!!!!!) so i cant wait for it. Just to repeat a point I made on the forums about the DLC. ...You don't have to pay the full amount. Its just giving you a wide variety of options to pick and choose which DLC is most preferable to you if any at all. 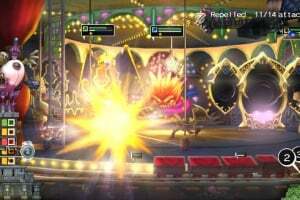 DLC is also financially necessary to recuperate the costs that went into creating the game not just so the producers get more profit from the DLC. 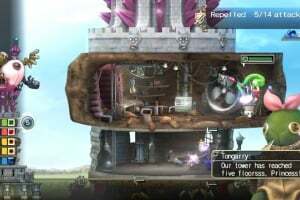 If there was no DLC available then the basic cost of the game would be much more than 1000 points so that Square would make their money back spent on producing it. DLC allows the game to be 1000 points. If this game was designed without any optional DLC, to be sold for 1000 points then it would be a much poorer and shorter game to keep under the budget allowed in producing it. 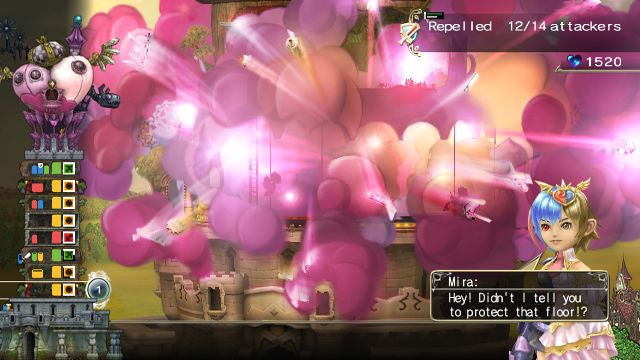 @ Bass X0: In a way it's like Crystal Defenders, but be sure to expect way more! 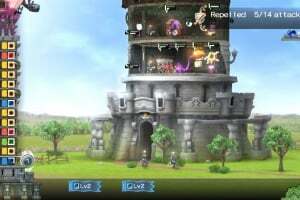 You don't only buy units but also rooms for your tower. 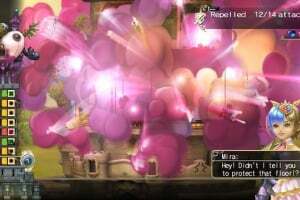 For example you have melee, ranged & magic units and rooms wich can attack foes, poison them or protect your own units. 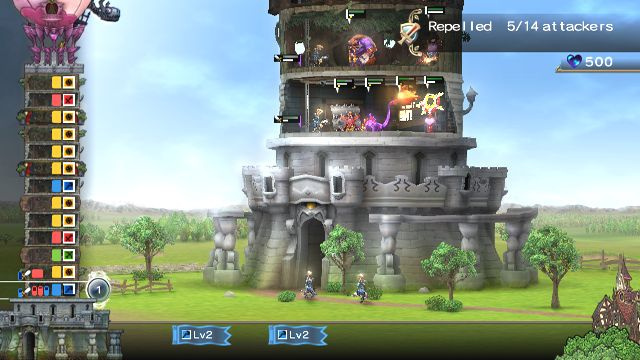 And foes are able to attack your units & rooms. So there are a lot of neat things they came up with. I would say that CD is really basic gameplay, while MLAAD is a lot more fun. You really need to lose your completionist nature in this day and age - its not going to do you any good at all. Square are not going to expect everyone to download everything that they have to offer. Really, just pick and choose what you feel like you want that is a reasonable price. I quite like it. Never played a proper tower defense game, which I am assuming this is a proper one. It starts off easy enough but the difficulty ramps up by the time you reach the second castle. I kept losing a lot but then I just realised I had to power-up my monsters as well as raising their level. Gah! Its easy to raise your Karma if you want to build up your monsters in a hurry - just keep replaying the first castle and have two floors of three Scorpions each. Then just let the game play itself. The DLC... they're basically cheats. 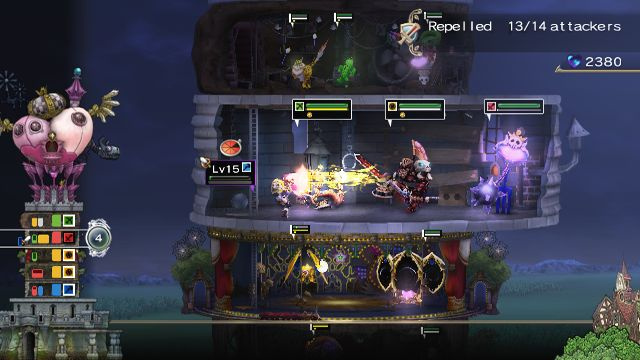 Stronger monsters, more NP thats all it is really. How many times have you played games only to hit a brick wall because you don't have the brains or skill to progress further? The DLC only serves to make the game easier for you and because you have to actually pay for it, you have to think about whether you really need the DLC to progress. There have been times where people have just switched on all the cheats that other games have and run through the game in record time ruining the game for them. I think its a good trade-off. If you're good at the game then you don't need the DLC. If you're not so good, just pick and choose what you think would enable you the to progress further without making the game too easy for yourself. 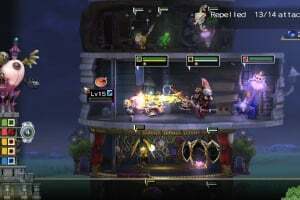 Still at lest Square have made good DLC this time. I mean for 300 point you can have Kain from FF4 as a Monster. Seems SE has pulled the DLC. News WiiWare Demo Service Now Available Worldwide!